Accuweigh’s Perth branch recently fitted onboard scales to a hay trailer for recording the amount of hay being collected from individual paddocks. The onboard trailer scales are again used to weigh the hay when is later sent to the processing plant. 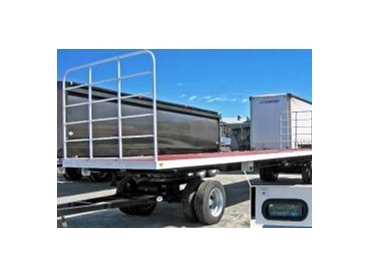 The onboard trailer scales comprise two PM 5 tonne loadcells fitted between the ball race of the dolly and deck of the trailer and four PM 30945 loadcells mounted between the trailer chassis and the spring hangers at the rear of the trailer. The weighing electronics of the onboard trailer scales are fitted inside an IP65 weatherproof enclosure and mounted to the trailer chassis in a position where it is clearly visible to the operator while the trailer is being loaded. Gilmac Hay specialise in exporting high quality hay products to lucrative Asian markets mainly Japan. Gilmac operates in South Australia, Victoria and Western Australia and is a regular user of Accuweigh supplied onboard trailer scales, weighbridges and container weighers.